Shortly after President Donald Trump’s inauguration, Counselor to the President Kellyanne Conway claimed that false statements coming from the White House were actually “alternative facts.” The new administration’s disregard for the truth is concerning on many levels, but it is particularly problematic for sound budget policy, which requires an honest evaluation of the cost of new legislation and the nation’s overall fiscal health. Data from the nonpartisan Congressional Budget Office, or CBO, is the main bulwark against false budget information. But lawmakers can always choose to use misinformation instead of CBO data. Moreover, if Congress follows through on its apparent plans to pass temporary tax and health measures, the resulting fiscal ambiguity will also make CBO data more nebulous. A lack of clarity in CBO data makes it easier for dishonest politicians to claim their fiscal falsehoods are actually just alternative facts. President Barack Obama took office at a time of great fiscal ambiguity. In 2009, many observers expected lawmakers to make permanent several laws that were scheduled to expire: tax cuts enacted under President George W. Bush in 2001 and 2003, temporary patches that prevented the alternative minimum tax from affecting middle-class households, and a large number of temporary—but frequently extended—tax benefits known as the tax extenders. Medicare was also under a cloud of uncertainty due to the Sustainable Growth Rate formula—a law originally passed in 1997 that would have forced large cuts in Medicare payments to physicians—which lawmakers consistently postponed with temporary measures. This fiscal ambiguity prevented the CBO from publishing a single clear projection for the federal budget outlook. Instead, the CBO published two different budget outlooks: a standard baseline in which temporary laws expired as scheduled and an alternative fiscal scenario in which many of these laws were permanently extended. The CBO’s standard baseline and alternative fiscal scenario showed two very different projections for the national debt. The alternative fiscal scenario showed the national debt hitting 181 percent of gross domestic product, or GDP, by 2035—well above the previous record highs during World War II. At the same time, the CBO’s standard baseline projected that the national debt would be at a much lower level of 79 percent of GDP in 2035. During the Obama administration, lawmakers permanently resolved most of the legislative uncertainty that motivated the creation of the alternative fiscal scenario, and the CBO finally discontinued it in 2016. 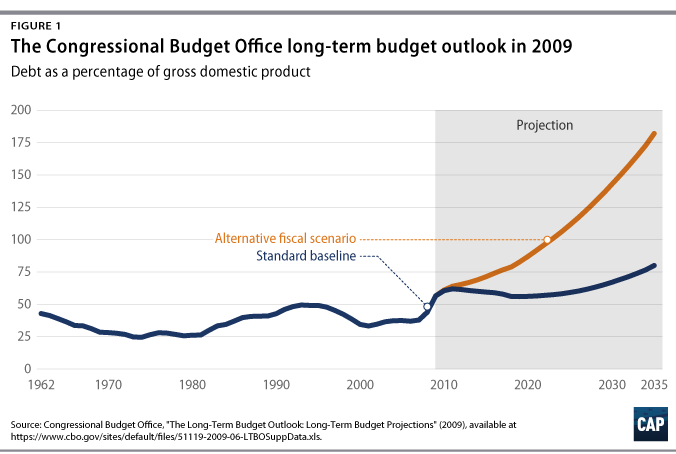 Today, the CBO can finally publish a clear budget outlook; but the new president and Congress may soon pass temporary measures that force the CBO to bring back the alternative fiscal scenario. If the CBO must publish two possible budget outlooks, it will be easier for the Trump administration to use whatever numbers suit its agenda. A disregard for reliable budget data paves the way for reckless fiscal policies that enrich those at the top at the expense of everyone else. During President Obama’s first term, lawmakers initially passed temporary measures to prevent tax increases due to the expiration of certain laws, such as a 2010 two-year extension of the Bush tax cuts. But fiscal ambiguity culminated at the end of 2012 in what was known as the “fiscal cliff.” The Bush tax cuts were scheduled to expire, along with the most recent patches for the alternative minimum tax and the Medicare Sustainable Growth Rate. Additionally, across-the-board spending cuts known as sequestration were about to hit vital federal programs. President Obama signed the American Taxpayer Relief Act, or ATRA, into law on January 2, 2013, which permanently resolved some of the most significant temporary laws contributing to the fiscal cliff. This legislation permanently extended most of the Bush tax cuts, but some of the provisions that only benefited the wealthiest Americans were allowed to expire. The bill also permanently amended the alternative minimum tax to protect the middle class. While ATRA only included temporary measures to address the tax extenders and the Medicare Sustainable Growth Rate, these were resolved on a more permanent basis in future legislation signed by President Obama. Unfortunately, the sequester cuts did take effect in March 2013 after ATRA included only a short delay, although lawmakers have since passed temporary budget deals in order to mitigate their worst impacts. 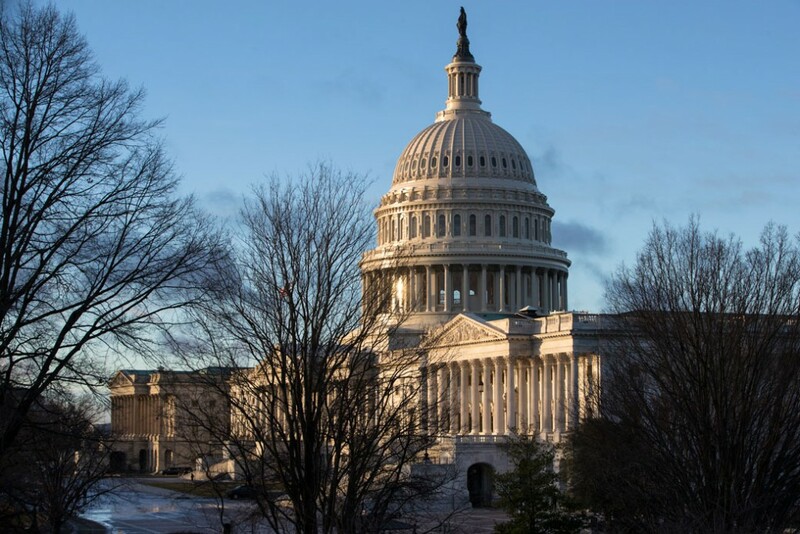 And lawmakers introduced new fiscal ambiguities in 2015 by temporarily postponing some of the tax provisions of the Affordable Care Act, or ACA. While fiscal ambiguity has not disappeared completely—particularly with regard to the sequester and some ACA taxes—overall fiscal ambiguity still declined substantially during the Obama administration. As a result, the CBO discontinued the alternative fiscal scenario in its 2016 long-term budget outlook. President Trump and Congress have already begun legislative efforts that would undo these eight years of progress. Lawmakers may repeal the ACA without a replacement but delay the effective date for ACA repeal, claiming that they will enact a replacement before the repeal takes effect. This would create tremendous uncertainty about future laws for taxes and health care spending. The CBO’s standard baseline would reflect the ACA repeal scheduled under current law, but a baseline that is designed to follow current law would struggle to reflect a future replacement that has not been—and may never be—enacted. The CBO may need to construct an alternative fiscal scenario to reflect the cost of replacing the coverage expansion in the ACA—as President Trump and Congress claim they will do—if these costs are not included in the standard baseline. Lawmakers may also force the CBO to bring back the alternative fiscal scenario by once again using budget gimmicks to force through tax cuts for the wealthy. Congress may use a procedure known as budget reconciliation to pass these tax cuts, which enables the Senate to pass this legislation with a simple majority on a party-line vote instead of gathering the 60 votes that are normally needed to avert a filibuster. Legislation passed under reconciliation cannot increase deficits in years after the time period covered by the budget resolution—generally 10 years—but lawmakers can subvert this rule by sunsetting the tax cuts so that they expire after 10 years. Of course, proponents of these tax cuts will not really mean for them to expire. This is just a budget gimmick to get them through the Senate, and proponents would subsequently push to make them permanent. To handle the uncertain future of these tax cuts, the CBO would likely show them expiring as scheduled in the standard baseline but assume that they are permanently extended in an alternative fiscal scenario, as was done for the Bush tax cuts passed using the same budget gimmick. The Trump administration could take advantage of the ambiguous budget outlook to make up its own numbers that are not based in reality. If the White House Office of Management and Budget publishes unreliable or false budget information, CBO data will be more important than ever. Congress established the CBO in 1974 for exactly this purpose: to provide reliable budget data independent of the executive branch. But it will be harder to use CBO data to refute false statements about the budget if the CBO has to publish two very different sets of budget data reflecting both a standard baseline and an alternative fiscal scenario. To be clear, the CBO’s alternative fiscal scenario was not like Kellyanne Conway’s alternative facts. Rather, the alternative fiscal scenario was a good faith effort by the CBO to reflect legislative uncertainty caused by temporary laws. But legislative uncertainty makes honest budget data more ambiguous, which makes it easier for dishonest political leaders to spread false budget data to advance their agenda. The high cost of the Trump tax plan would undermine fiscal support for programs such as Medicare and Medicaid that benefit low- and middle-income Americans, but this threat will be obscured if the tax cuts are passed on a temporary basis via reconciliation. The CBO’s standard baseline would show the tax cuts expiring, thus reducing future deficits and improving the long-term budget outlook. The Trump administration might tout the CBO’s standard baseline to claim its policies are fiscally responsible, even if President Trump does not actually support allowing his tax cuts to expire in order to achieve the fiscal outcomes projected by that baseline. It took eight years under President Obama to finally provide enough clarity in spending and tax laws for the CBO to be able to publish a single budget baseline. If conservatives continue to push forward and use reconciliation to cut taxes and repeal the ACA, they will likely force the CBO to revive the alternative fiscal scenario to reflect the new budget uncertainty and further open the door for fiscal falsehoods to influence the budget debate. Harry Stein is the Director of Fiscal Policy at the Center for American Progress.